Here is a potpourri of Bird facts and trivia. It's in no specific order, but is certain to educate and enlighten you. Armed with this information, you can use it to amaze fellow bird watchers. Blue Jay Feathers are gray. The blue you see is actually an optical illusion caused by light refraction. The proof....hold a Blue Jay feather up to the light and it will be gray. Which weighs more, a nickel or a Hummingbird? A nickel weighs 5 grams. But, a Hummingbird only weighs four grams. By most estimates, 90 to 93 million people feed birds and watch wildlife in the U.S. That's about one in four people who participate in this feathery hobby. Why?...because it's fun! Gardening is the second most popular hobby. Wildlife watching and feeding is #1. It includes birds and other animals. All those bird enthusiasts translates to a $2.5 billion industry. There are over 9,000 species of birds. There are over 700 bird species in the United States. 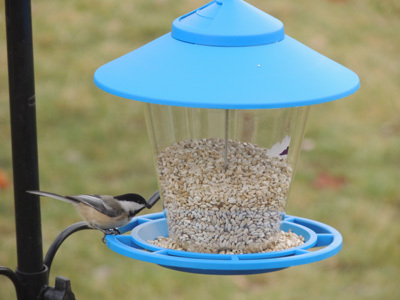 Of all these species, only about 25-30 are regular visitors at your bird feeder. Some are year round residents, and some are migratory. Hummingbirds eat more insects than nectar. Ants are their favorite insect meal. Purple Martins consume over 2,000 insects a day. But bats eat even more. Squirrels do not like Safflower. Neither do many bird species. Sparrows came to the U.S. in the 1800's. They were released into the wild, and are now extremely populous on many areas. The shape of a bird's bill relates to the type of food it eats....hmmmm, makes sense.